Slice zucchini lengthwise in to 1/2" slices. Leave skin on the zucchini (you can also use summer squash). Coat shallow cookie sheet with olive oil (or use cooking spay). Lay the zucchini slices next to each other on the cookie sheet. Be sure not to overlap the slices. Sprinkle the zucchini with salt and pepper to taste (or sprinkle a little basil for extra flavor). Place in broiler about 4" from the element and watching closely allow the zucchini to turn a nice brown. Takes about 6 minutes (don't be afraid to brown zucchini pretty good, just not black!). Pull out zucchini and sprinkle generously with parmesan cheese on top. Place back in broiler for 1 to 2 mintes, just enough to brown the parmesan cheese and make it crusty, but do not burn. Scoop out on to plate and serve. 315 members have added this recipe to their cookbook. I cut the zucchini in 1 1/2 inch pieces and quartered them. Tasty recipe no matter how you cut them! Very good. 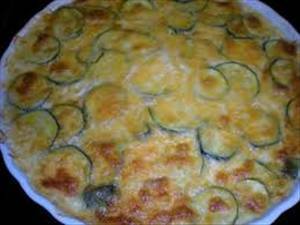 My daughter dipped the zucchini in whipped egg whites and coated with flaxseeds before baking and adding parmesan cheese. She liked the added texture. Fantastic! My 3 year old daughter loved it. Opted to add basil and used pam. this was very lovely. used oo pam instead of the oo and it was wonderful. Only 5.2 net carbs after subtracting fiber. Great side dish with a piece of baked Chicken. There are 149 calories in 1 serving of Parmesan Crusted Zucchini. Calorie break-down: 62% fat, 18% carbs, 19% protein.